A lower melting point makes delicate aluminum radiator repair work easier. Matching Kapp Golden Flux™ acts as a temperature guide to ensure simple application and successful bonding. Use any heat source - oxy-acetylene, natural gas or propane torch, heat gun, or soldering iron. Excellent multi-purpose solder, may be used on aluminum, stainless steel, white metal, pewter, copper, brass and galvanized. In most cases, the repair is stronger than the original metal. Can be plated with chrome, nickel or copper. Step 1 - Pre-clean the parent metal or metals to be joined. Use emory cloth, a wire brush, sandblasting, etc. 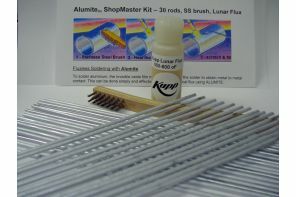 Prepare aluminum surfaces with a clean stainless steel wire brush. Step 2 - Apply Kapp’s non-corrosive liquid Golden Flux™ to the repair area. You may use the rod to spread flux. Step 3 - Use a soft flame, heat gun or soldering iron to heat the parent metal adjacent to the repair area. A direct flame on the repair area is likely to overheat the solder and flux. to the rod or flux, pull the torch tip back even farther from the work surface and keep it moving. Step 5 - The flux will begin to bubble and turn light brown. This prepares the parent metal for the solder, and indicates the proper working temperature. (If the flux turns black, it has been overheated. Let the area cool, clean it up and start over at step 1.) Drag the solder rod over the area to be soldered, until it begins to flow. STOP APPLYING THE HEAT! Apply additional layers as needed. Step 6 - Sometimes it is necessary to heat the tip of the rod slightly with the flame to help the solder flow more easily onto the repair area. DO NOT HEAT THE ROD TO THE MELTING POINT! Step 7 - Observe the solder deposit. The solder should bond smoothly. DO NOT OVERHEAT! The rod will melt if overheated, but will not bond properly. Step 8 - If you stopped soldering and want to apply more solder or flow out the existing deposit, let it cool, add more flux and reheat. The flux will help the bonding process, whether adding more rod or just flowing out the previous deposit. Step 9 - Remove the excess flux with warm water and a cloth or wire brush. Breaking the oxide coating by agitation and fluxing is one key to successful soldering, especially for Aluminum parts. It is important to follow these steps in a timely uninterrupted 1-2-3… sequence. Otherwise, the strong oxide coating can reform and hinder the solder bond. So, make sure you have all your tools and supplies staged and ready to go before you begin. For some difficult to solder and large surface area joints, it may be extremely helpful to pre-tin the joint area on each part with the solder before setting up to join the parts. Simply follow the steps below to coat the joint area of each part with an even coat of solder. Then, after the parts have cooled, follow the steps again to join the parts. The 1-2-3 rule applies here as well. Don’t pre-tin one day and solder the next. A fresh oxide-free surface is important to soldering success. Pre-tinning your parts with the right solder can greatly improve joints on difficult to solder metals & large surface area parts. Pre-clean the parent metal or metals to be joined. Bevel the edges of parts at the joint to allow an area for the solder to fill and bond to the parts. 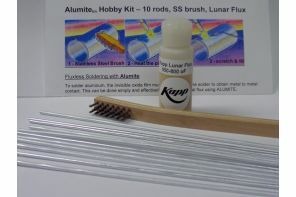 Prepare Aluminum surfaces with a Stainless Steel wire brush. Breaking the tough oxide coating on the Aluminum parts is the secret to strong and reliable solder joints. These barriers reform quickly, so agitate, flux and solder in a rapid sequence. 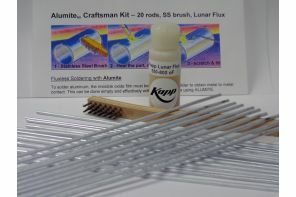 Apply Kapp Golden™ Flux to break the oxide barrier and draw the solder into the joint/repair area. Don’t forget to leave a sufficient gap for the flux and solder to flow between the parts. The Kapp Golden Flux active range is 350-550°F. You may easily use the solder rod to spread the flux. Use a soft flame, heat gun, or soldering iron to heat the parent metal adjacent to the repair area. A direct flame on the repair area is likely to overheat the solder and flux. DO NOT DIRECTLY HEAT THE SOLDERING ROD or FLUX! If using a torch, hold the torch tip 4 to 6 inches away from the parent metal. If it is necessary to apply the flame directly to the rod or flux, pull the torch tip back even farther from the work surface and keep it moving. The flux will begin to bubble and turn light brown. Besides preparing the parent metal for the solder, these changes indicate the proper working temperature for the flux. If the flux turns black, let the area cool, clean it, and start over. When the flux bubbles and turns brown, it is time to apply the rod. Drag the rod over the area to be soldered, until it begins to flow. ONCE THE ROD FLOWS, STOP APPLYING THE HEAT! If additional layers are needed, continue to drag the rod over the area. With some applications, very thin wires for example, it may be helpful to tin the Aluminum surface with the rod before soldering the parts together. In this case, follow steps 1-6 to apply an even coat of solder to the Aluminum parts. Let these parts cool, and then follow steps 1-6 again, soldering the parts together. This will often result in a more consistent solder joint for small parts. Observe the solder deposit. The solder should bond smoothly. DO NOT OVERHEAT! The rod will melt if overheated, but will not bond properly. Remove the excess flux with warm water and a wire brush. Remove any plating, natural oxide, or foreign matter from the surfaces to be joined. "V" out the fracture and set up the job solidly. Use #1 or #2 tip to preheat the area surrounding the fracture. 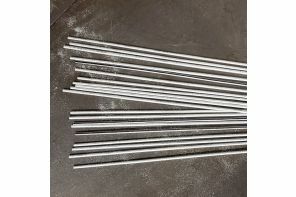 The weld is then made by heating the fracture directly with a neutral flame until the SURFACE of the base metal can be broken by touching it with the ALUMITE rod. KEEP THE ROD AWAY FROM THE FLAME AS MUCH AS POSSIBLE WHEN STARTING THE WELD. Continue welding the fracture by puddling the solder in the base metal. NEVER PLUNGE INTO WATER TO COOL. Finish as desired. depend on base metals, soldering methods and type of joint.